Yesterday about thirty people went to two offices on Victoria Street, Bristol, to show their support for sacked workers from Amey. This demonstration, called by Bristol – No Borders, came as part of a wider solidarity with migrant workers who are being squeezed between unscrupulous employers on the one hand and new government legislation on the other. It seems that while employees work for less than minimum/living wages, with few rights then it’s ok. 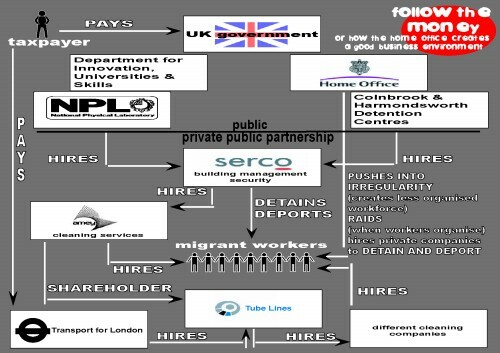 But, as soon as they begin to organise to collectively improve their conditions, immigration legislation is rolled out to intimidate them, as shown in both the case of the largely Latino workforce dismissed by Amey and the cleaners on the London underground. Bristol No Borders call for solidarity with all workers whether they have papers or not. We are aware that this is a tricky time to defend migrant worker’s right, as many fear losing their own jobs and the media stir up talk of putting limits on immigration to protect ‘British’ jobs. But we think this is the right time to be making the arguments that we will not be divided by bosses and governments. This is ultimately more than just a matter of rights and fair treatment for migrant workers – it’s about the “race to the bottom” that determines deregulation, worse pay and standards for all workers in the UK. 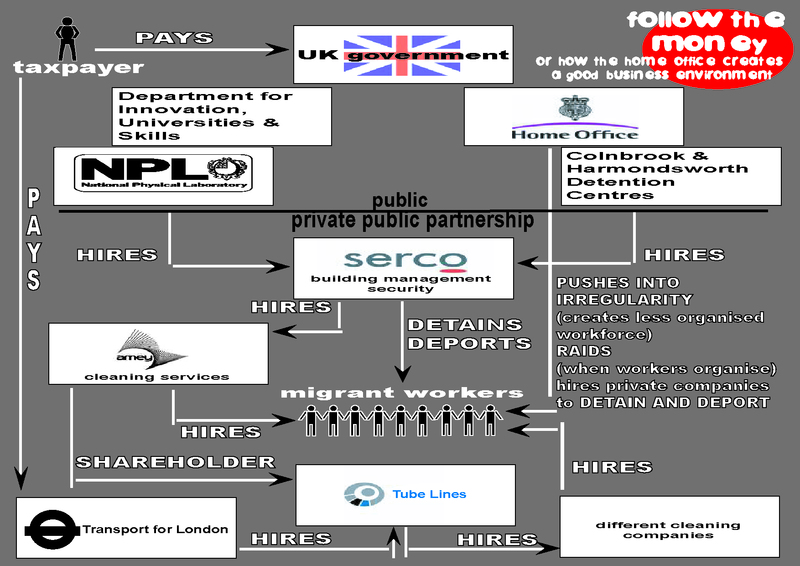 Migration controls are a weapon against the whole work force. They divide us and are a tool of discipline the workforce. If there are workers with less right or no rights, this undermines the position of workers as a whole. The answer must be to oppose immigration controls. EQUAL RIGHTS ARE IN THE INTERESTS OF ALL WORKERS. Five cleaners employed by Amey (who have the contact for rail maintenance in Bristol) were sacked for “damaging the company image” on the 2nd of October. They are going to appeal. How were they damaging the company image? By belonging to a Trade Union and telling other staff at the National Physical Laboratory (NPL) in London where they work what was happening to them.